WOW! I feel like I haven't written a post in forever! I've been incredibly busy with school and this rotation. My last day is this Wednesday (big tear) and I have to present my research paper this Friday. My next rotation is Psych (yawn) so I'll be back into the swing of things with more projects and FFF soon! As is custom, I've made my parting cupcakes! The weather has been absolutely gorgeous here and we've already planted tons of flowers. In the spirit of Spring I decided to make flower cupcakes!! While my cupcakes were baking I cut up the flowers. I used my kitchen shears to cut the long side of the marshmallow into thirds. I used the regular size marshmallows, so I only had four petals for each flower. You could probably do the same thing with the mini marshmallows and have tons of tiny flowers! I don't have a neat icing bag (although I'd like to get one) so I use the DIY way. Before I started frosting I took my can of frosting and whipped it in my kitchen aid. I read this tip somewhere, and it really fluffs your frosting letting it last longer. Last time I made cupcakes with the same container of frosting I only had enough for 24. This time I was able to frost 36 cupcakes and I had quite a bit leftover. I put a quart size ziplock bag into a cup and fold the edges over the side of the cup. Then I use my spatula and put the frosting into the cup, scraping it on the side. Then I'm left with a HUGE bag of fluffy frosting. Just cut a small hole in the corner of the bag and frost away! After the cupcakes were frosted I put four "petals" onto the frosting, then put a chocolate morsel in the center! The mallows look more like petals if you pinch the edge together. Viola! Flower cupcakes! I was really hoping to get some good photos in daylight, but I have to take these to work tomorrow, so night photos it is! Originally I was going to make 24 flower cupcakes and 12 swirly cupcakes, but decided to make more swirly cupcakes. I sprinkled those with edible pearl-like sprinkles. I got the cupcake wrappers at Michaels for $1/pack! Each pack has 50 liners. I wish I would have bought more!! Here they are all together! It looks like a little flower field! these are adorable! and i hope you spit that bite out fast.... ;) actually hope it was good and you finished it! I love these...they are so PRECIOUS!! Yum! I'm reading blogs in bed and am so tempted to go to the kitchen and look for snacks. You just made me so hungry!! Those edible pearls look so pretty. Love the flowers too. Have fun on your last day of rotations!!! Very cute - perfect for spring! I tagged you in a little blog game over on my blog. Feel free to play along. I love these cupcakes! You're so talented! We're passing on the Versatile Blogger Award to you - Stop by Bringingbeauty.blogspot.com and check out our post to learn more! Such a cute idea! 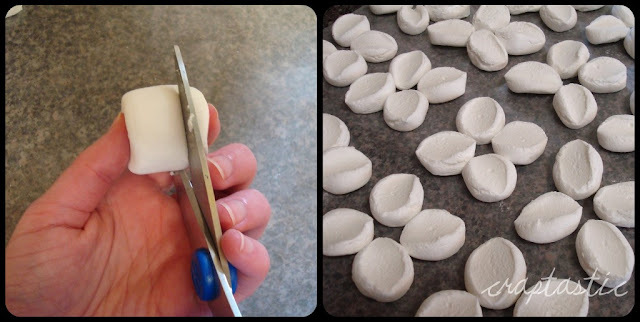 So clever to make the flower petals out of marshmallows. More Surgery Stories, Thank You and A Giveaway!